Excerpt from Memorandum of Law submitted to Federal District Court, Northern District of Illinois, Eastern Division by Dr. Linda Shelton on November 10, 2008 in case no. 08 C 4627, a Petition for Writ of Habeas Corpus in a criminal contempt conviction arising from a fraudlent still pending vendor fraud case, asking the federal court to declare the criminal contempt conviction void. The vendor fraud case is where Dr. Shelton is fraudulently charged with Medicaid Vendor Fraud, under Illinois statutes, and trial is presently pending in the Circuit Court of C[r]ook county before Judge Jorge Alonso (who replaced the Dishonorable Judge Kathleen Pantle). 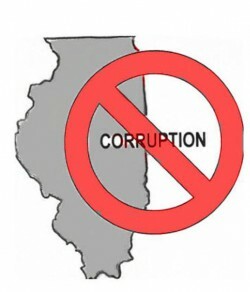 Dr. Shelton has committed NO fraud and is being illegally attacked by the Illinois Attorney General as a sham prosecutor without authority in the Circuit Court of C[r]ook County (only the State’s Attorney has legal authority to commence and prosecute a criminal case in Illinios with the exception of certain environment, gambling, and drug crimes as specified by statute), which therefore also has no jurisdiction, rendering the case null and void. The indictment was illegally handed down by a “special” grand jury after the Asst. Attorney General John Fearon illegally appeared before the grand jury without jurisdiction, fraudulently stated the law to the grand jury, and suborned perjury by the State’s witness, Illinois State Police Investigator Reibel who committed perjury before the grand jury and withheld exculpatory evidence, rendering the indictment void. Inv. Reibel had previously fabricated evidence against Dr. Maisha Hamilton in a similar case. (He cut out her handwriting exemplars in order to use them on invoices he fabricated to charge her with forgery. The forgery charges were later withdrawn). Inv. Reibel also interviewed non-English speaking Arabic patients of Dr. Shelton WITHOUT a translator, shortly after 911 (they were scared of the plainclothes officers, some thought they were FBI agents accusing them of terrorism and answered NO to every question asked even though they didn’t understand the questions) and testified to the grand jury that these patients all said they never saw or heard of Dr. Shelton. This is kind of analogous to charging someone with murder, but not informing the defendant about the name of the victim, the date of the alleged murder, the type of weapon alleged to be used, the method by which the victim died, or the place or even continent at which the murder is alleged to have taken place. Without the who, what, where, and when, the indictment is fatally defective and the case is void! The indictment is fatally insufficient, the Defendants have not been given any details or evidence as to which invoices are alleged to be fraudulent or what is fraudulent about them, and no evidence that explains what Dr. Shelton’s role is alleged to be in preparing or submitting the invoices. Dr. Shelton did not start working for the group until 2001 and did not sign any paperwork allowing the group to bill under her Medicaid number until late 2001. She did not own the group or have any role whatsoever in running the group practice until after April 2002. The charges against her are therefore, entirely bogus. Dr. Shelton underwent extensive and serious neurosurgery on her neck (breaking all bones and reconstrucing them to relieve congenital spinal stenosis that crushed the spinal cord and was causing extensive paralysis – she is disabled) in July 2000. The recovery period when she was unable to work was prolonged. She therefore was incapable of even performing any of the alleged fraudulent acts charged [although not clearly described] at the time period of the indictment. State actors are attacking her in retaliation for her whistle blower activities against corrupt Illinois and C[r]ook County officials including Illinois Attorney General Lisa Madigan. This habeas petition is in regards to the criminal contempt finding by Dishonorable Judge Kathleen Pantle in May 2005 which Dr. Shelton alleges is void because the base pending case in which it was brought is void, thus rendering the hearing a nullity. Case law holds that a contempt charge cannot stand if it results from a void order. The indictment is void, thus the pending vendor fraud case is void. Therefore, all orders in the case including orders to appear on certain dates, bail orders holding Dr. Shelton for trial, etc. are thus void. The criminal contempt case has gone through all direct appeals (affirmed conviction by IL Appellate Court – which blatantly violated the law, IL Supreme Court denied leave to file appeal – thus exhausting state remedies). Dishonorable Judges Pantle and Alonso have either refused to hear fully briefed motions to dismiss by Dr. Shelton or denied motions to dismiss with unlawful statements such as “federal law does not apply” or the “Illinois Attorney General has jurisdiction because she is the chief law enforcement officer in Illinois.” Both of these judges are intellectually dihonest, arrrogant, rude, violating their oaths of offices to enforce the laws and constitution, and simply wrong in their rulings. One has to speculate that they may be under the influence of corrupt officials because of the extreme nature of their ignorant and wrongful statements over a four year period of time. Justices of Boston Mun. Court v. Lydon, 466 U.S. 294, 302-303 (1984) The Court stated that exhaustion requirement was satisfied by presentation of claim on appeal to state supreme court from denial of motion to dismiss. This may be on point in case at bar as all motions to dismiss were presented to the trial court in the pending vendor fraud case and then included in the argument on the criminal contempt case as proof the criminal contempt case is void because the pending vendor fraud case is void. requirement was satisfied only by presentation of claim to highest state court. In case at bar, the claim of voidness of pending vendor fraud case has been presented to highest state court through motions for leave to appeal in direct appeal and motion for leave to file petition for habeas to Illinois State Supreme Court – both denied. Wayne v. Missouri Bd. Of Probation & Parole, 83 F.3d 994, 996 (8th Cir. 1996) The Court ruled that the exhaustion requirement was satisfied when petitioner presented federal claims in full round of litigation before state trial and appellate courts even though relitigation in state forum through another procedural device possible. In case at bar this is very much on point as pending vendor fraud case issue of lack of jurisdiction and voidness was presented through full round of litigation via criminal contempt direct appeal and collateral habeas appeal, although should Petitioner be convicted in allegedly void pending vendor fraud case, she could again directly appeal issue of lack of jurisdiction through state appellate courts and collateral habeas proceeding. considered a petitioner’s claim on direct appeal, initiation of a collateral attack in state court is not required even if a state postconviction remedy would permit reconsideration of the claim. In case at bar, this concept of possible reconsideration in another avenue therefore, does not negate the fact of exhaustion of remedies. Casille v. Peoples, 489 U.S. 346, 350 (1989) (dictum) The Court ruled that to force petitioner to exhaust other state remedies after fairly presenting claim to the highest state court would be “to mandate recourse to state collateral review whose results have effectively been predetermined, or permanently to bar from federal habeas prisoners in States whose Postconviction procedures are technically inexhaustible”. Anderson v. Harless, 459 U.S. 4, 6 (1982) The Court ruled that “the habeas petitioner must have ‘fairly presented’ to the state courts the ‘substance’ of his federal habeas corpus claim.”. In case at bar this is on point in this pending vendor fraud case as all claims of lack of jurisdiction and voidness have been fairly presented to the state appellate courts who chose to ignore the issue or not consider the issue. Humphrey v. Cady, 405 U.S. 504, 516 n.18 (1972) The Court ruled that “[the] question . . . is whether any of petitioner’s claims is so clearly distinct from the claims he has already presented to the state courts that it may fairly be said that the state courts have had no opportunity to pass on the claim”. In case at bar, claims in pending vendor fraud care and criminal contempt case regarding lack of jurisdiction of court in pending vendor fraud case are identical. This case law suggests that any type of presentation to the appellate courts of the state satisfies the requirement for exhaustion of state remedies. In the pending vendor fraud case there has essentially been a full and fair litigation of the issue of jurisdiction and thus voidness through the appellate court system in Illinois both on direct appeal and on collateral habeas proceedings regarding the pending vendor fraud case through the criminal contempt case. The Illinois Supreme Court has denied leave to appeal and leave to file petition for writ of habeas corpus. In Lewis v. Borg, 879 F.2d 697 (9th Cir. 1989) the Court ruled that exhaustion requirement was satisfied when state supreme court denied state habeas petition without comment. Therefore, denial of leave to appeal would exhaust state remedies. The Federal District Court has jurisdiction of petitions for writs of habeas corpus under 28 U.S.C. § 2254 which requires the petitioner to be “in custody.” Jurisdiction is established for this purpose as long as the petitioner is in the custody of the state when the petition for writ of habeas corpus is filed. Carafas v. LaVallee, 391 U.S. 234, 238, 88 S.Ct. 1556, 1559, 20 L.Ed.2d 554 (1968) (overruling Parker v. Ellis, 362 U.S. 574, 80 S.Ct. 909, 4 l.Ed.2d 963 (1960)). Article III of the Constitution allows Federal Courts to adjudicate only actually, ongoing cases or controversies. See Americans United for Separation of Church and State v. Prison Fellowship Ministries, 509 F.3d 406, 420-421 (8th Cir. 2007); Potter v. Norwest Mortgage, Inc., 329 F.3d 608, 611 (8th Cir. 2003). “This case-or-controversy requirement subsists through all stages of federal judicial proceedings, trial and appellate” and, “[w]hen an action no longer satisfies the case or controversy requirement, the action is moot and a federal court must dismiss the action.” Potter v. Norwest Mortgage, Inc., supra at 611 [citations and internal quotations omitted] Therefore, there must be consideration given to whether or not a controversy still exists when a prisoner after filing or when filing a petition for writ of habeas corpus is no longer in custody. The United States Supreme Court has wrestled with this issue for decades. The inquiry was narrowed to consider the possibility of providing the petitioner further redress for the claims that have been raised. If this is impossible, the case is moot. The Court in Spencer v. Kemna, 523 U.S. 1, 118 S.Ct. 978, 140 L.Ed.2d 43 (1998) found that once a habeas petitioner is released from custody, his case becomes moot, unless he can show that a writ of habeas corpus would still provide him some genuine benefit. This line of reasoning began decades before in the United States Supreme Court. The second exception recognized in St. Pierre supraat 43, permits adjudication of the merits of a criminal case where “under either state or federal law further penalties or disabilities can be imposed . . . as a result of the judgment which has . . . been satisfied”. St. Pierre supra at 43, implied that it was the burden of the petitioner to show the existence of collateral legal consequences. The Court Ginsburg v. State of New York, 390 U.S. 629, 633, 99 S.Ct. 1274, 1277, 20 L.Ed.2d 195, n. 2 (1968) held that the mere possibility that the Commissioner of Buildings of the Town of Hempstead, New York, might “in his discretion” attempt in the future to revoke a license to run a luncheonette because of a single conviction for selling relatively inoffensive “girlie” magazines to a 16-year-old boy was sufficient to preserve a criminal case from mootness. ruled that collateral consequences should be considered in determining mootness. Although the term has been served, the results of the conviction may persits. Subsequent convictions may carry heavier penalties, civil rights may be affected. As the power to remedy an invalid sentence exists, we think, respondent is entitled to an opportunity to attempt to show that this conviction was invalid. Morgan at 512-513 supra. The Sibron Court clarified the constitutional importance of giving the petitioner his day in court on a habeas corpus petition after release from custody, in the face of any direct or collateral consequences. None of the concededly imperative policies behind the constitutional rule against entertaining moot controversies would be served by a dismissal in this case. There is nothing abstract, feigned, or hypothetical about Sibron’s appeal. Nor is there any suggestion that either Sibron or the State has been wanting in diligence or fervor in the litigation. Sibron supra,at 57. The Court therefore concluded that analogously Sibron’s petition for writ of habeas corpus was not moot because he “has a substantial stake in the judgment of conviction which survives the satisfaction of the sentence imposed on him. Sibron supra,at 57-58. Citing Fiswick supra, at 222. Subsequent release of the petitioner does not oust the court of statutory jurisdiction because with a conviction there are presumed collateral consequences that persists after termination of sentence. Carafas. at 237-238 supra. [including inability to engage in certain businesses, inability to vote, inability to serve as official of labor union, inability to serve as juror, impeachment of character, enhancement of future sentence, etc. depending on laws of state] Even in the case of a non-felony criminal contempt conviction the 5th Circuit Court of Appeals held that even the direct consequence of a fine constitutes consequences that persists after termination of sentence. Port v. Heard, 764 F.2d 423 (1985). In Lane v. Williams, 455 U.S. 624, 102 S.Ct. 1322, 71 L.Ed.2d 508 (1982), the U.S. Supreme Court narrowed the presumed collateral consequences doctrine so that termination of sentence did not oust statutory jurisdiction when the issue presented in the petition for habeas corpus involved the conviction and not specifically only the sentence. As the issue of the sentence no longer existed if the petitioner was released from custody (incarceration or parole), then the petition for habeas corpus became moot under the specific circumstance that the petitioner did not question the validity of his conviction, but only applied for the writ based on his sentence. In Spencer v. Kemna, 523 U.S. 1, 118 S.Ct. 978, 140 L.Ed.2d 43 (1998), the Court further narrowed the presumed collateral consequences doctrine stating that the presumption of collateral consequences to conviction do not flow to parole violations in order to satisfy Article III injury-in-fact requirement for the Court to retain jurisdiction. Therefore, the line of reasoning in the United States of Supreme Court in deciding whether or not a “live” controversy still exists after a petitioner for a writ of habeas corpus has been released from custody, firmly established the principle that criminal convictions entail collateral consequences that keep the controversy “live” after release when the issues in the habeas petition concern the conviction, although not when the issues pertain solely to the sentence, nor when the conviction is in regards to a parole violation.